Romanesque style deserves more attention than it gets. Gothic style gets top billing among medieval buffs. 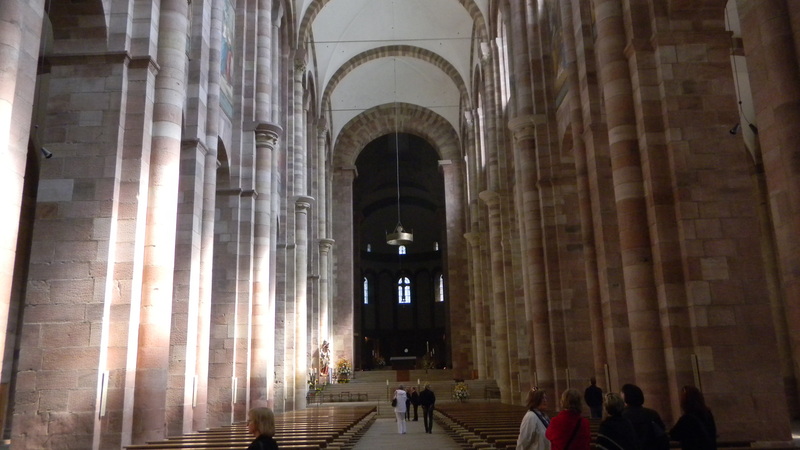 But appreciate Romanesque cathedrals on their terms, and they’ll greatly reward you. 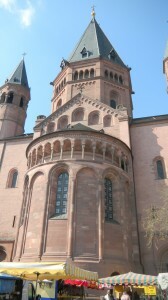 In the picture above, the cathedral in Mainz towers over the town market. Its Romanesque arches rise with simplicity and elegance that project the medieval church’s insistence on spiritual unity. But it also projects the secular ruler’s imperial glory. Both fused in this powerful art form that can leave you speechless if you explore it deeply enough. Enter if you dare. Romanesque architecture was a perfect idiom for Europe in the 11th and early 12th century because it was towns were growing, political territories were becoming more defined, and Roman Civil Law was increasingly used. Romanesque style’s regularity and simplicity expressed a unified world under one church and one secular ruler. 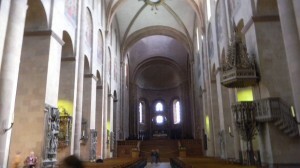 Romanesque style uses the horizontal basilica form that Ancient Rome developed–a long hall with a semi-circular apse at the end. 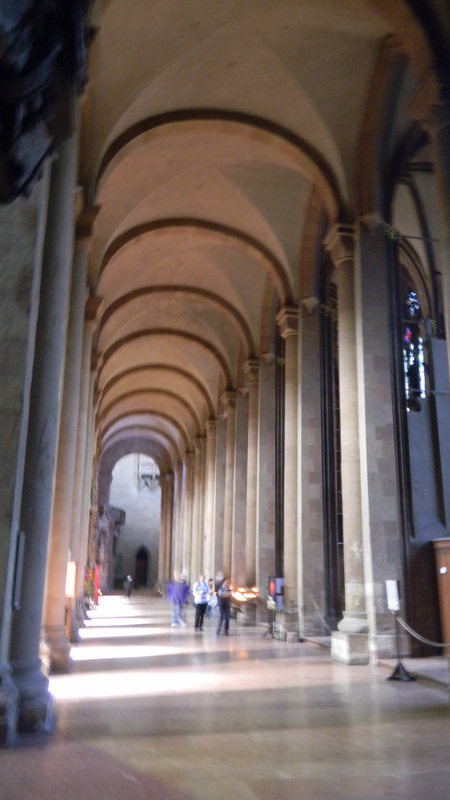 But it raised the ceilings into arched vaults that were repeated with geometric regularity. The columns at the side and the arches over the columns are equally regular. Spatial units repeat in proportions as stately as those of ancient Greek temples. 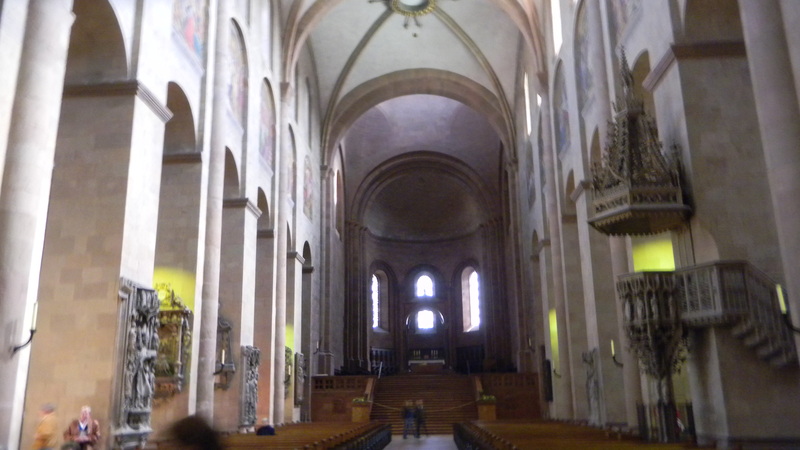 The aisles were equally regular and regal–as the above pic of Mainz Cathedral shows. King Henry IV tried to declare his independence from Pope Gregory VII after they tussled over the right to appoint bishops and the Pope excommunicated him. 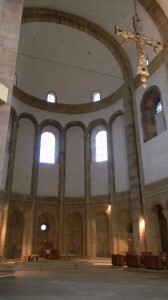 Speyer was Germany’s imperial city then (it spreads on the banks of the southern Rhine, and was thus a key node in trading routes between Italy, the northern Rhine, and France to the west), and Henry buffed up the imperial cathedral (pictured immediately above and below). In your face, Rome! 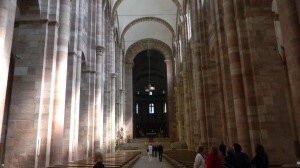 But many people still find Romanesque cathedrals spellbinding. Linger in one and you might find the all-encompassing unity and the simplicity more attractive than today’s complex and hyper accelerated world. They were dreams that were unattainable in Europe’s diverse land with many sovereignties, but many people still long for them, and Romanesque style is one of their purest embodiments. But Romanesque style became very diverse. Please see Romanesque Style Against Itself for a more nuanced look at this great art form. You can read more about the society that created Romanesque style in Medieval Europe.